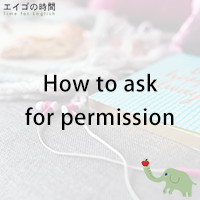 When you want to borrow a pen or ask a question, how do you seek permission to do so in English? There are many ways, but let’s learn to ask for permission by using can, could and may today. Can is informal but very commonly used. Can I use your pen? Could is more formal and polite than can. Could I use your pen? If you want to be even more formal and polite, use may. May I use your pen? Now keep in mind, could is only used to ask for permission, not to give or refuse it. In other words, if someone asks you “Could I use your pen?”, you can’t say “Yes, you could” or “No, you couldn’t”. You should say, “Of course, you CAN” or “I’m afraid you CAN’T“. I’ll continue to talk about how to deal with these “Can I…?” or “May I…?” questions on Thursday. So, please come visit our website. 2. May is more formal and polite than can. 3. You can’t use could to ask for permission.